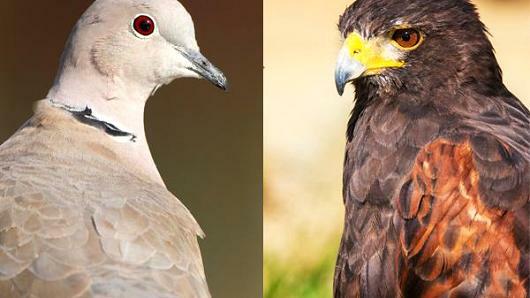 Avian Games: Chicken, or Hawk-and-Dove? Much has been made of the Greek Finance Minister’s credentials in game theory. Because I commute to Greece a lot, and because I’ve had some exchanges with Yanis Varoufakis on his blog in the past (when he was not yet in politics), people often ask me what I think of him, who he is, how he thinks and where it’s all going. There is much that I do not know. What we do know is that Varoufakis knows a thing or two about game theory. He has co-authored a book about it, and it’s probably his and my shared love for game theory and for Greece that made us find each other’s blogs and trade a couple of discussions (long before he become a politician). He is also smart, and he is an academic. So he knows a thing or two about how things work in theory. But to state the obvious: Game theory is a theory. It analyses games in a model reality. Whether in real life you are in the game you think you are in, that’s a skill for the practitioner. You ask: “what game is Greece playing?”, and I reply you don’t always choose the game, but choose how to play it. The game the EU and Greece have settled on is called “chicken” in game theory, and we have already described it in detail elsewhere. In this game both sides are big losers if no-one yields, but the act of yielding extracts a heavy price in terms of reputation, which will hurt you especially if you have to repeat the game in the future. If two animals fight for a limited resource, and are given only the two choices to (a) fight (be a “Hawk”), or (b) walk away (be a “Dove”), then two Doves will peacefully share the full resource between them, having established that neither is going to attack. If two Hawks meet, they will also share the resource in some (perhaps random) way, but both will have incurred some ‘cost’ in fighting (the cost may be random and very high). If, on the other hand, a Hawk and a Dove meet, the Hawk will get everything at zero cost and the Dove gets nothing. Well, it turns out that the best strategy if you get to play the game only once is to make the most credible attempt possible in pretending to be a Hawk while actually being a Dove. When you are in one of the cars heading for each other, growl, scream, throw bottles out he window, swerve and then come back onto the road again. In short give the impression that you are mad and unpredictable, and definitely capable of doing mad things like not swerving under any circumstances. Do not signal that you may compromise, even though you know you will. In the Cuban Missile crisis the leaders pretended they were ready to use nukes to get things resolved. Well, luckily it worked. Even if you are almost sure that the threat isn’t credible, who’s going to risk it? In politics, you get into a game of chicken when the political or reputational cost of giving in has become very high. That’s were Brussels, Berlin, and the Greek government are in respect of their electorate. Both have drummed up voter rhetoric that makes it very, very costly to back down. Famously, the key to solving the Cuban missile crisis was to give Krushchev a face-saving ‘way out’, telling the Russian public that the US backed down from an invasion. Krushchev even proposed to give Kennedy a way out by offering to pretend that the Russian ships never carried any nukes in the first place. So it will have to be with Greece. For now, everyone still wants to pretend to be a Hawk, being crazy, mad, and willing to risk everything, while actually being a Dove. The true colours can only be shown in the eleventh hour. The game is set up that way. The EU will keep saying they can afford to let Greece go, and Greece will not make enough concessions until the very last minute. In the end, both will help the other side to offer a story to their respective electorates, providing a script that says the other side blinked first. Varoufakis has to strike a difficult balancing act: (1) playing the game of chicken as best he can, appearing mad, unreliable as a negotiating partner, cut from a different mold as the Eurocrats, and dragging his feet on concessions. But (2) he also has to play to the rank and file in Greece, and to his fellow ministers, who want to be assured that he isn’t actually mad. But that means the game isn’t a two-player game of chicken. When you are in the car together with 10 million others, 15 or 20 are in charge, and everyone is discussing loudly what you should be doing, it gets difficult to pretend to be a Hawk. It’s not “chicken”, it’s radio-broadcast-chicken. That’s where his job becomes that much harder. Politics trumps game theory here. He is learning. He now knows he’s in the radio-braodcast version of chicken. He is learning that politics doesn’t always allow you to play with the cards close to your chest, and that this makes your strategy much more difficult (but it does so also for Brussels and Berlin; at least the situation is symmetric). Had he been fully, uncoditionally put in charge by Tsipras, it would have been a masterstroke by the PM. The PM could have pretended to have authorised a madman to run the show, and Varoufakis would have played the part as only a game theorist can. The PM would have got exactly what he has been trying to achieve all along, namely to move the discussion up to the level of the heads of state, who would have had a much harder time playing chicken as none of them wants to appear crazy. But because internal agreements have to be struck all along the way, that strategy is dead, and the finance ministers are continuing to play radio-broadcast-chicken, which suits the other PMs just fine: everyone can pretend to have an (almost) madman finance minister (almost) in charge, and switch guards and messages at the eleventh hour. So that’s all just analysis, and you will rightfully ask me what’s my actual opinion. Fair enough, here it is: The current government of Greece is the best shot any of us, including the Greeks, have at getting things resolved, simply because it has the popular support, and because it absolutely cannot be blamed for Greece’s current predicament. No-one else in Greece can ‘sell’ a solution to the public nearly as well as they can, so we must work with them at all costs. Blaming Greece for its current predicament may be fun. It may even be just, but it’s of no use. Greece cannot pay. If Finanzen 100 in Germany is to be believed, Greece is the only country in the EU that has actually reduced its debt in absolute terms between 2011 and 2014! It has taken the medicine and has taken the pain that Europe has asked of it. Just go and visit and look around. But because the economy has been shrinking so much faster than its debt, the debt has nonetheless become even more unsustainable. This must stop, and this is the message on which a hitherto untested party spectacularly won the election. So to everyone in the Eurozone, I say it’s time to get over it, get on with it, and work with these guys. It’s the best shot you have. If you want to resolve things, stop humiliating the very guys who are your best chance of doing it and who didn’t have their hands in the cookie-jar. Or just have the guts to pull the plug. With the current tried and tested approach of squeezing Greece to the max, blaming Greeks, and then lending just enough money to survive another day, we’ll lose the will of electorates in and outside Greece to go on with the show. The public discourse in the Eurozone is becoming more and more poisonous. Friends who have one foot in Greece and one in Germany tell me that they can’t discuss the situation with anyone any more, as they get attacked from both sides. I ask: who is winning? The founding fathers of the EU thought the project would bring us closer together. Their principal assumption, the very founding idea, is being sorely tested. ← Deflation the symptom, Demographics & Debt the disease; Default the cure? I should add one more thing: Today’s comments by Schaeuble, namely that the IMF recipes are tried and tested and have worked elsewhere is not genuine, and I suspect he knows it: The IMF medicine has been tried and tested in situations where it goes hand in hand with a currency devaluation. The past experiences of IMF prescriptions do not translate well into a small country that is part of a very much larger currency union. The Master is back! How are you? Here is another interesting one from ZeroHedge: If you look at the table (https://twitter.com/zerohedge/status/604751207735947267) you can work it out that it would cost approx. EUR 20 p.a. per Eurozone citizen even to pay ALL of Greece’s debt. And what would the alternative cost? More argument to stop this storm from escaping the teacup. Enter e-mail address to receive updates.